These are the dramatic moments real-life law enforcement looked more like a Hollywood film as police tracked a suspected truck thief in the US. Aerial footage from TV station KWTV showed a man remove a large item from a pick-up before a motorist tries to stop him by shooting at the vehicle’s tyres. The drama, which lasted nearly three hours, then saw the suspect evade police efforts to puncture the truck’s rubbers near Oklahoma City. 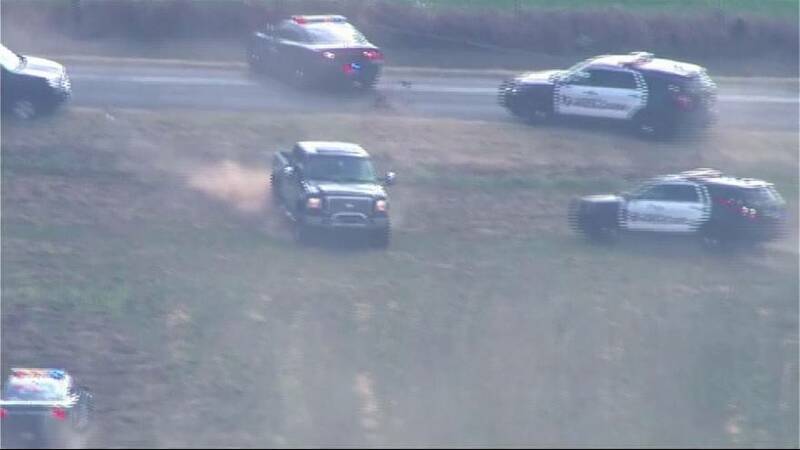 The vehicle then evades police efforts to corner him, leading officers on a chase across fields, eventually ending up near a pond. Footage shows the pick-up reverse at speed into the water, before the suspect attempts to escape by wading away from police. An officer then shoots the suspect with a stun gun, before he is handcuffed and taken away into custody.